Dubai: It has been six years since Godolphin last won the $2.5 million Dubai Gold Cup (Group 2), sponsored by Al Tayer Motors, but that looks set to change when Cross Counter lines up alongside nine rivals to contest the 3,200-metre contest, the longest race on Saturday’s card. Trainer Charlie Appleby’s exciting Melbourne Cup hero, the mount of William Buick, spearheads a strong four-pronged Godolphin raiding party that includes his stable companion Ispolini (Brett Doyle) and fellow-Godolphin handler Saeed Bin Surour’s Team Talk (Christope Soumillon) and Red Galileo (Pat Cosgrave). The four-year-old son of Teofilo is making his first appearance since shocking the world by winning the Melbourne Cup, over the same distance as the Gold Cup, at Flemington, Australia, last November. he is quite easy to get fit for his first start of the year. Cross Counter brings strong form into Saturday’s race having finished in the money in all eight of his starts, which include five victories including a stellar performance in the Group 3 Gordon Stakes over a mile and a half at Goodwood, UK, last August. Commenting on the chances of his duo, Appleby said: “We are looking forward to getting Cross Counter’s campaign under way following his Melbourne Cup success. “His preparation has gone well — he is a clean-winded horse, so he is quite easy to get fit for his first start of the year — and we are hoping that this can be a step for some of the major staying prizes throughout 2019. Lightly raced Team Talk, who finished eighth in the Group 2 Dubai City Of Gold on Super Saturday, March 9, at Meydan attempts the two mile trip for the first time. 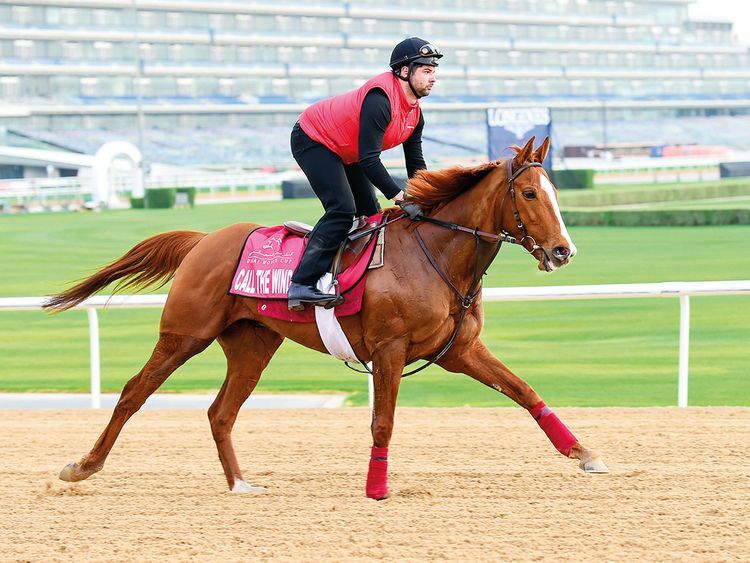 Red Galileo, a consistent performer at the Dubai World Cup Carnival, hopes to improve on his sixth-place finish in the race last year. Bin Surour added: “I am looking forward to seeing how Team Talk gets on over this distance, as I think the step up might suit him. The Godolphin quartet take on some strong overseas opposition, led by the Freddy Head-trained French raider Call The Wind. Head, a former jockey-turned-handler, returns to Dubai for the first time since 2015 when he saddled Solow to win the Dubai Turf. The French handler commented: “The horse looks well. He seems to be in great form. He is calm and mentally relaxed. The Richard Gibson-trained Gold Mount steps up to 3,200 metres for the first time and while his handler admits that it is a big ask, he remains hopeful. Gold Mount is Hong Kong’s first runner in the Dubai Gold Cup and only the third Sha Tin-based horse to run over the 3,200-metre trip in the last 15 years. The field also includes Prince Of Arran, Marinaresco, Platinum Warrior and Sharpalo.